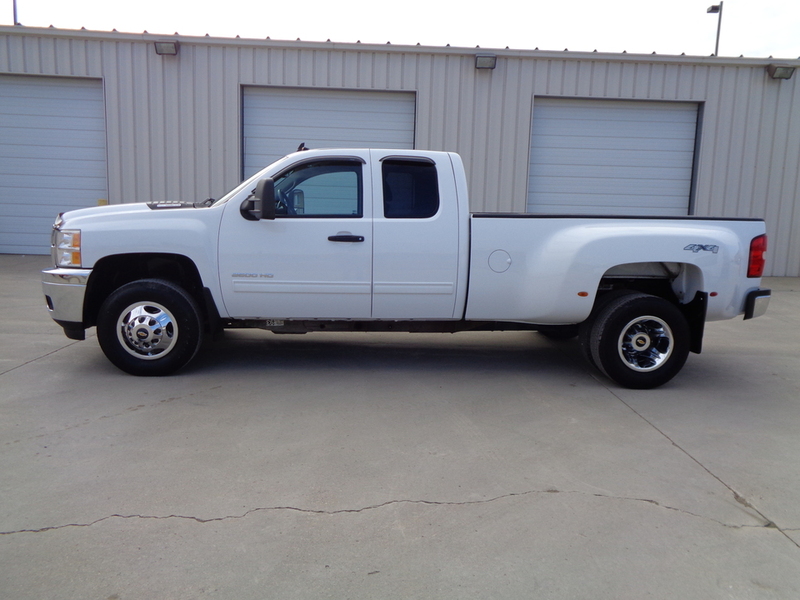 Check out this white 2013 Chevy Silverado 1 ton, 3500HD LT 4 door extended cab diesel dually truck! WIth only 192,449 miles, and for its age this truck is exceptionally clean. At out low asking price of $19,950, this truck will surely be sold very quickly. It has the tow/haul package, trailer brakes, and a 5th wheel turnover ball in the 8 foot long box with a drop in bed liner in it, with bed rails to protect the bed. It is equipped with a big shield, and rail guards on the windows.It's black cloth interior shows no signs of wear or tears. It will be easy for almost anyone to drive this vehicle with its power adjustable pedals, back up camera, and park assist. It is even equipped with an exhaust Jake Brake. Its chrome front and rear bumper, and Chevy wheel simulators really make this beauty shine! It is equipped with Firestone Transforce HT LT235/80R17 tires. You can check out all of the options on this truck on our full website at www.autodriveinc.com. To schedule a test drive, or for any other questions, you can call us at 515-955-3399. You can also stop by AutoDrive Inc. at 2944 5th Avenue South, Fort Dodge, IA 50501 to see it in person. We are open from 9:00AM-6:00PM Monday through Friday, and 9:00AM-3:00PM on Saturday. We will consider anything for a trade, and can possibly assist you in getting financing with our local lenders.